Situated in the Covered Bridge Resort, Bearly Normal is a 3-bedroom, 2-bathroom log cabin with space for 10 — perfect for fun family vacations, couples’ retreats, or weekends with friends! This cozy abode features lots of mountain charm, community amenities, relaxing spaces, and conveniences that will make you feel right at home. Plus, since it’s pet friendly, Bearly Normal is a space you can enjoy with every member of your family, including your pup! 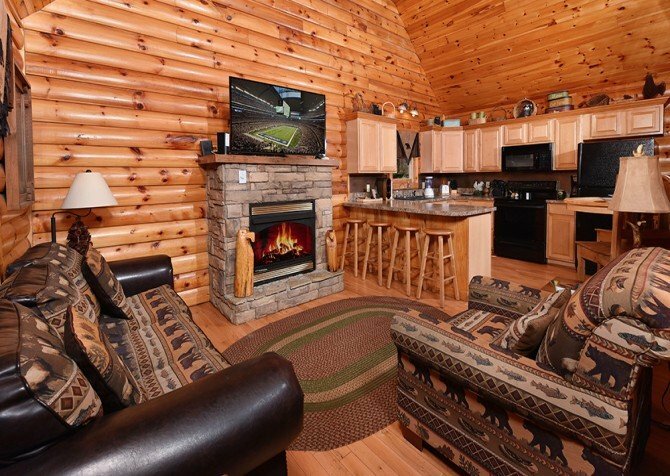 On cool mountain nights, cozy up in the living room by the electric fireplace and flatscreen TV for laid-back evenings. Upstairs in the loft, you can play some foosball or arcade games before heading back downstairs for a meal made in the fully equipped kitchen. In the bedrooms, find peaceful retreats from it all. 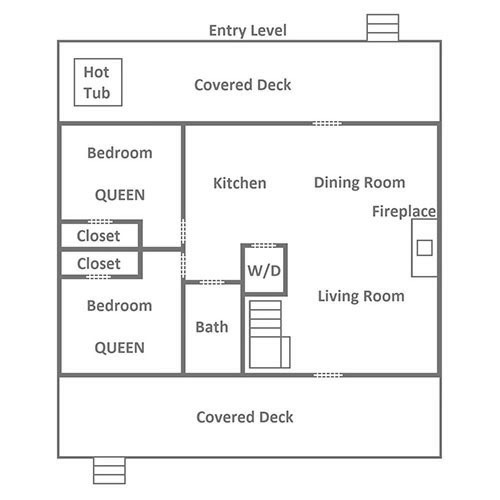 The cabin features 1 king bed and 2 queens, along with 2 queen sleepers for additional space. 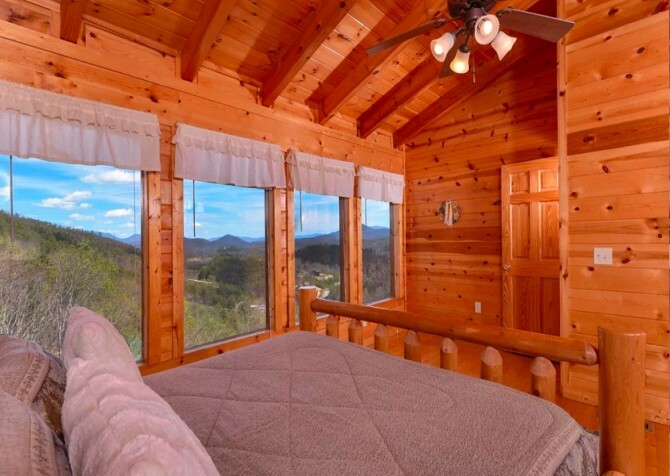 Each bedroom has its own TV and lovely touches to remind you you’re in the Smokies. Outside, enjoy cookouts with the charcoal grill, a paved driveway for easy unpacking, and a soothing hot tub where you can unwind and ease tired muscles after long trips and busy days exploring downtown Pigeon Forge and the Great Smoky Mountains National Park. You’ll even have community pool access when you enjoy a summertime stay at Bearly Normal! Leave your luggage at the door and walk into your Smoky Mountain paradise at Bearly Normal! Start things off with a fun exploration of the home’s fun amenities, then settle down for a leisurely chat on the living room sofa and arm chairs while the little ones pal around on the large area rug. With large windows, an open concept, and tons of natural light, this space is the perfect communal room for the gang to hang out and plan in-town activities. On chilly eves, get a fire going in the electric fireplace, whip up a fresh batch of cocoa in the nearby kitchen, and swap ghost stories with friends or finally start the novel series on your list of must-reads. And if the kiddos start to get a little bored, turn on the original Xbox for classic gameplay or take advantage of the the Wi-Fi in the cabin. Just around the corner, you’ll find the fully equipped kitchen with stainless-steel appliances, plenty of counter space, and all the cookware needed to prepare homemade meals at Bearly Normal. Store restaurant leftovers and fresh ingredients in the fridge, serve hot breakfasts straight off the stove, brew endless pots of joe, pop everyone’s movie-night favorite (with extra butter!) in the microwave, keep things clean in the double sink, and let the dishwasher handle all the dirty work. Set the round table for 6 at mealtimes in the dining space, just off the kitchen and open to the living room. With bar seating for 2 at the kitchen counter and plenty of seating in the living area, you can keep conversations going with ease at every meal. After dessert and coffee, clear the table for board or card games brought from home or bought in town. Ready to turn your vacation up a notch? Head upstairs to the rec room! Knock out all your foosball foes and challenge your bestie to an arcade duel. There’s also a plump sofa — the perfect place for your defeated comrades to recoup. As a bonus, you can even see the rolling hills of Great Smoky Mountains from the largest window, a gorgeous view to be sure! Ah, it’s time to relax and recharge after a full day perusing quaint country shops, watching your littlest try taffy for the first time, taking on The Escape Game, and riding mountain coasters! There are 3 bedrooms to choose from — 1 with a king-size bed, 2 with a queen, and all with flatscreen TVs! 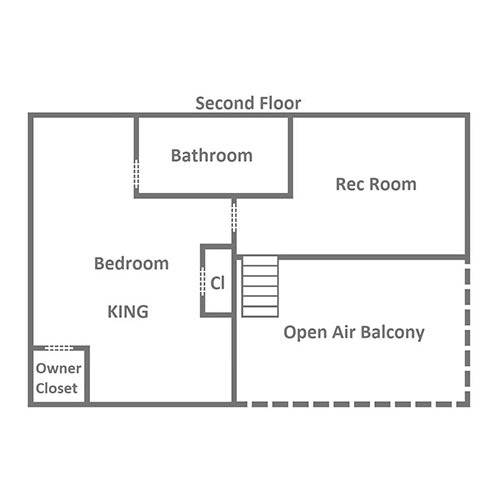 The queen bedrooms are on the entry level, while the king bedroom is on the second floor. Spacious to say the least, the master suite boasts high ceilings, an arm chair, rocking chair, and best of all, an indoor jetted tub. Wake up to woodsy views and songbird tunes and begin the day with a spa bath to wake the muscles and soothe the mind. There are also 2 queen sleepers at the cabin for a total of 10 possible guests. Step outside for a beautiful mix of mountain and wooded views, rocking chair chats, and rejuvenating hot tub soaks. The driveway is paved and curvy, with room for 3 vehicles, so you can keep carpooling to a minimum. And there’s also a charcoal grill, perfect for steak dinners and barbecue feasts! 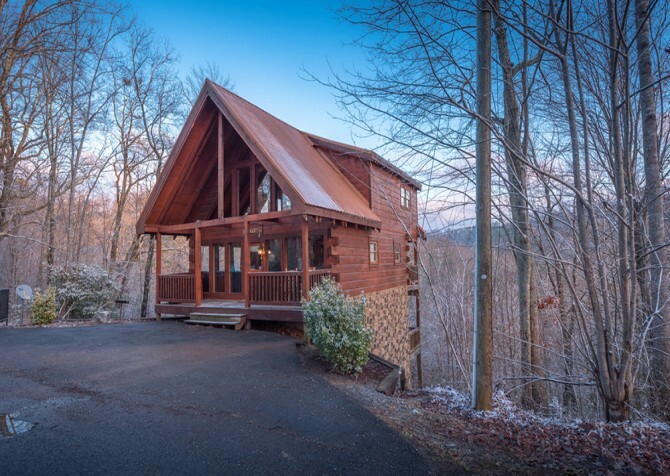 One of the best perks at Bearly Normal is the ability to spend quality time with your furry friends in the Smokies as this cabin is pet friendly. You’ll also have access to the outdoor community pool through Covered Bridge Resort, so be sure to pack a swimsuit in summer! And if you’d prefer to pack light, the provided washer and dryer make it easy-peasy. Located just a hop, skip, and a jump away from the heart of Pigeon Forge (less than 6 miles), Bearly Normal keeps you and yours close to plenty of fun attractions as well as a plethora of dining and shopping options. Wind through the trees, zigzag down the mountain, and soar past goats (yes…actual goats) at The Coaster at Goats on the Roof, a unique experience indeed! If you’re looking for a one-stop entertainment complex with rides, games, Southern dishes, boutiques, and more, then The Island in Pigeon Forge is the place for YOU! Learn all there is to know about crime and justice at the Alcatraz East Museum, home to 100+ interactives and the Jailhouse Junk giftshop. 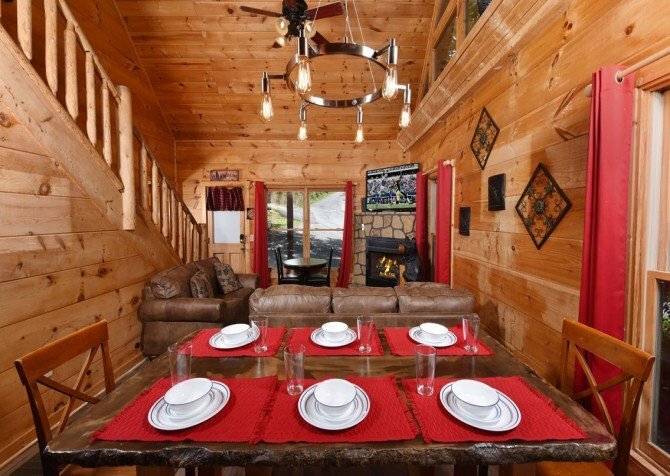 "This beautiful cabin is conveniently located for quick and easy access to Pigeon Forge and Gatlinburg. Since our dog goes wherever we do, I've often found I need to accept lower quality if they are willing to allow our pet. That was NOT the case…"
"Bearly Normal was a great cabin with a great view! The cabin was clean and had all the amenities we needed! The cabin is 5 minutes from all the action in Pigeon Forge!" We are thrilled to hear how much you love Bearly Normal! Thanks so much for leaving a kind and helpful review. We can't wait to serve you with another memorable cabin stay in the future! 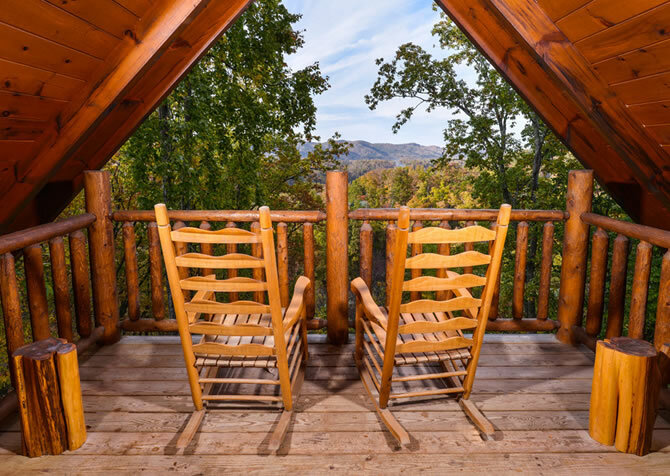 "This beautiful cabin is conveniently located for quick and easy access to Pigeon Forge and Gatlinburg. Since our dog goes wherever we do, I've often found I need to accept lower quality if they are willing to allow our pet. That was NOT the case here! If it weren't for the leashes and doggie bags the wonderful owners left available, you wouldn't know a pet had ever been there. The beds were comfy, everything we needed in the kitchen was there, and lots of fun was had in the game loft! My only recommendation might be to add a mirror or two, preferably full length." Words can't express how happy we are to hear how much you and your pup loved Bearly Normal! We really appreciate your kind review and will pass along your valued feedback. Please come again soon for more game fun, comfy sleep, and new memories with your precious pet!